In Weekend in Havana, a salesgirl (Alice Faye) threatens to cause trouble when cruise ship runs aground and vacation is ruined. As compensation, she gets a first class Havana holiday with the ship owner’s future son-in-law (John Payne). As well as some unexpected attention from a conniving gambler (Cesar Romero) and his girlfriend (Carmen Miranda). Nan Spencer (Alice Faye, State Fair, Alexander’s Ragtime Band) – a sales clerk at Macy’s. She’s been saving for years for her cruise ship vacation, and can’t take another at a different time. A nice lady, but firm, she pressures the company into giving her her vacation. Jay Williams (John Payne, Miracle on 34th Street, Springtime in the Rockies) – vice president at the cruise company. He makes it his job to ensure that Nan has a good vacation, so she’ll sign a waiver. He’s also engaged to his boss’ snobbish daughter, Terry. Terry McCracken (Cobina Wright, Charlie Chan in Rio) – the boss’ daughter, who is insecure — and threatened by Nan. Rosita Rivas (Carmen Miranda, Scared Stiff, Something for the Boys). Singer, dancer, and Monte’s girlfriend. She steals most of the scenes that she’s in. 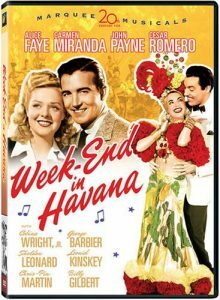 Week-end in Havana is an enjoyable romantic comedy from the 1940’s Hollywood. What’s frankly interesting is that the secondary romantic characters, Cesar Romero and Carmen Miranda, are more interesting than the romantic leads. 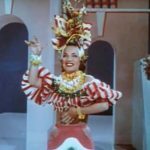 They’re more interesting, Carmen Miranda is a more compelling character, and more fun to watch. LIkewise, Cesar Romero is enjoyable as the lovable rogue — a gambler who can’t win — until the very end of the movie. Week-end in Havana is reminiscent of Springtime in the Rockies, although a weaker version. 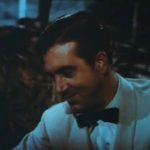 John Payne sings, but it’s not his strong suit. I rate Week-end in Havana 2 stars out of 5 — an enjoyable movie, but not exceptional. “The Man with the Lollipop Song“, was cut from the film. Briefly heard is John Payne singing the tune. Betty Grable was originally scheduled to star but was replaced by Alice Faye. Minor appearance by film clown Billy Gilbert. Inspired casting and Walter Lang’s deft direction breathe abundant life into WEEK-END IN HAVANA, in which a woman’s trip to Cuba leads to romance, laughter, and sizzling songs. 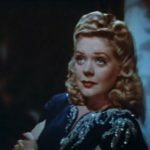 Nan Spencer (Alice Faye) has saved up for years for her vacation to Havana and is sorely disappointed when the cruise ship runs aground near Florida. While the other guests accept vouchers for another trip, Nan refuses because this was her only opportunity to get away. 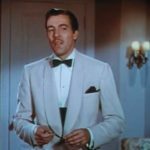 When she intimates that the failure with the ship was the captain’s fault, the cruise company’s vice president, Jay Williams (John Payne), personally accompanies Nan to Havana to avoid any more serious legal repercussions. Entrusted with ensuring that Nan will have a good time, Jay pays handsome ne’er-do-well Monte Blanca (Cesar Romero) to romance her. Meanwhile, Jay is forced to relieve Blanca of his own girlfriend singer, Rosita Rivas (Carmen Miranda), who decides Jay is a fine substitute for her romantic attentions. This wacky love quadrangle provides WEEK-END IN HAVANA with plenty of material for several boisterous song-and-dance routines. “Week-end in Havana,” “The Man with the Lollypop Song,” and “Tropical Magic” are among the catchy numbers featured in this spicy musical fiesta.